Experience has shown us that it is impossible to embed our music in a way that can be accessed by all browsers. If your browser does not open these files and you would like to listen to the band, please Email us an email with the title "Send us the Music" and we will reply with each music file attached to a separate email. 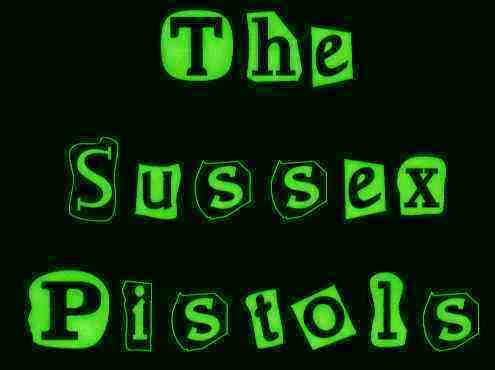 The Sussex Pistols are a lively and enthusiastic band with a wealth of experience, who have been playing music together since the early 1990s. The band plays barn dance music for all social occasions. A barn dance (sometimes called a ceilidh) is the ideal social event for getting people of all ages to mingle and have fun together. The emphasis is always on having fun and the band's infectious rhythms and foot-tapping music encourages participation and guarantees a successful occasion. No dancing experience is necessary, the caller (Vic) gives clear instructions and calls through the dance before you start and during the dance but if you make a mistake it can all add to the fun. Vic chooses appropriate dances from his wide repertoire to suit the abilities and experience of the dancers and the occasion. For much of their existence the band was graced with the wonderful musical presence of the late Naomi Russell and this will always be sorely missed. 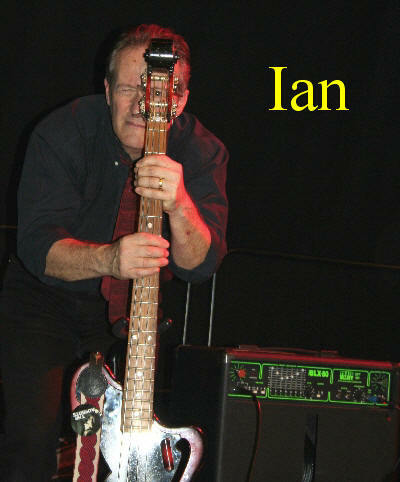 Ian Kearey was founder member and bass and sometime guitar player for The Oyster Band (as they were then known), appearing on their albums until 'Wide Blue Yonder'. He has worked as producer with Michelle Shocked and Sheffield band Boot Fare, while recording and playing live with, among others, John Fahey, Texas fiddler Erik Hokkanen, Billy Bragg and Leon Rosselson, Sandra Kerr, Ivor Cutler, Anne Lister and singer/songwriters Heidi Berry, Pete Astor and Caroline Trettine - not to mention street-corner busking in LA with Ry Cooder. He also plays in Duck Soup alongside Dan Quinn and Adam Bushell. He has been a constant on albums by Bristol poetry/rock legends The Blue Aeroplanes, and in 1987 released a guitar/vocal album, 'Siamese Boyfriends' with Aeroplanes leader Gerard Langley, which was described in the Melody Maker as 'joining up the dots between Martin Carthy and Ry Cooder - brilliantly'. A solo album, 'Preaching to the Convertible', received very good reviews on its release in 2001. He has released three well-received solo albums, encompassing songs, improvisations with a drummer and instrumentals; see www.danlenorecords.com. Dave Levett has worked with a great variety of country and folk rock, blues and rock bands over the years. As well as this band, he currently plays with a glam-rock band! 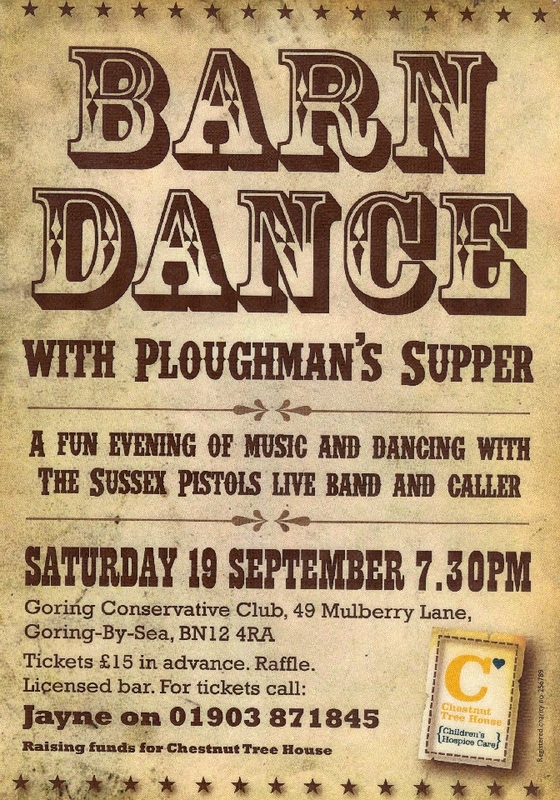 He is a real multi-instrumentalist but with the Sussex Pistols, he is mainly heard playing bass guitar, although he also plays banjo, melodeon and whistle. He has had a long association with barn dance bands and has played with The Catsfield Steamers, Chequered Roots, Banjax and Maxwell's Demon. Ben Paley has been playing the traditional music of Sweden, Ireland and the USA (as well as blues, jazz and rock of various kinds) since he was six, on the stages, screens and street corners of two continents. His book of Swedish traditional tunes is one of the classics of that music. As a fully professional musician, he has toured and recorded extensively with his famed father Tom, both as a duo and with Joe Locker as the New Deal String Band, the leading Old Timey band in Europe. He was a member of the prominent country/rock band, The Wild Turkey Brothers. In that band, he played alongside the guitarist, Tab Hunter, whom he still plays with regularly as a duo. He has been in considerable demand as a session musician and he has worked with Chris Wood, the Levellers, the Sawdoctors, Mandragora and Murray Lachlan Young, He has been called "The finest folk fiddler of his generation" by fROOTS magazine. Bing Lyle is the powerhouse of the band with his mighty accordion playing. He started his musical career as a chorister at Canterbury Cathedral, which gave him a lasting love of modal music. His classical training studies derailed by exposure to Punk Rock and traditional music, he took up the accordion and busked for five years round Europe. Bing was musical director of the Brighton community arts organisation Same Sky from 1989-96 since when he has been working with all Ireland concertina champion Mandy Murray, singer-songwriter Pete Morton, singer and storyteller Pete Castle. He is a regular tutor for the folk arts project Trads and Herbie Flowers' Rockshop. In 1998 he joined the Travelling Light Theatre Company's production of Tir na n'og. touring the UK, Ireland, Canada and the USA. Although he plays accordion, piano, flute and guitar, Bing is essentially a singer and composer; his original songs and tunes make up a large part of the Lyle/Paley repertoire. 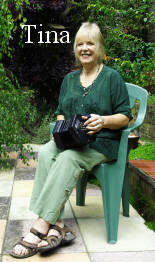 Tina Smith plays English concertina. She has been involved with folk music for over 40 years, both as a musician and an organiser. She was co-resident and organiser at two London folk clubs in the mid-sixties and at clubs in Brighton, Isfield and Lewes from 1968 onwards. She was one of the organisers of the popular Lewes Folk Days and has been involved in many other Sussex folk events both as performer and organiser. She was one of the residents at the Coppersongs folk club in Peacehaven. Up until 1975 she was one of the founding presenters of the BBC Radio Brighton folk music programme, "Minstrels Gallery". She has played in several bands, including The Creepy Crawley Concertina Combo, The Dodgy Button Band, The Lewes Band and Four Piece Suite. She is one of the resident performers at the Royal Oak Folk evenings in Lewes. Vic Smith plays guitar and mandolo and is the band's caller. He has been involved in folk music activities for more than 40 years as singer, folk dance band musician and caller, club, festival and event organiser, broadcaster, journalist, critic and writer and magazine editor Along with Tina, he has been running folk clubs in Woolwich, Blackheath, Brighton, Isfield and Lewes. The current very successful venture at the Royal Oak has been running since 1992. Again with Tina, he has played and called with a number of successful folk dance bands. Along with Jim Marshall, he organises and edits "The Sussex Folk Diary" and has been doing so for over 30 years. Again in partnership with Jim, he was presenter/producer of "Minstrels Gallery" the weekly local radio programme which catered for folk music enthusiasts in the south of England for 25 years. 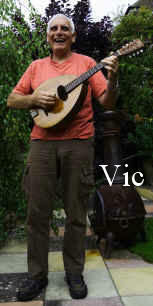 He writes for a range of folk and traditional music publications including "Musical Traditions" and "fRoots". 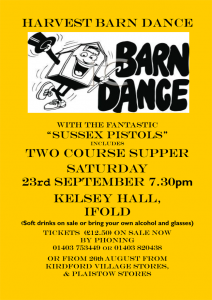 Just a brief note on behalf of the Branch to say thank you to the Sussex Pistols for the wonderful evening you helped to create on Friday and above all for helping us raise over �800. People who had no idea what a Barn Dance was came and thoroughly enjoyed themselves. The music just had to be danced to, and the calling was beautifully precise and sensitive to the "learners" among us. So please pass on our thanks to your band members. I want to add my heartfelt thanks to you both and to Bing and Dave for an absolutely great evening. Everyone had a super time and the atmosphere was buzzing. We�ll let you know how much we raised when it�s been worked out. Just to thank you very much for such a lovely evening yesterday - we really enjoyed it. Please convey our thanks to Vic for his wonderful calling of the dances. It was good to learn some new dances and he explained all the moves and demonstrated so well that he made it seem easy! We thought the band were excellent too so thank you too to them all. It was a fantastic evening. Thank you for contributing to a great event celebrating our daughter Helen and son-in-law Paul's wedding. Your talent is not to be underestimated! David and I cannot thank you, Vic and the team enough for your wonderful performance at our silver wedding anniversary party. We had an absolute ball and I was amazed at some of our friends who never dance getting really stuck in! As ever, you were great fun, guided the newcomers and made the whole evening go with a swing. Thank you so much for helping our party go with such an enjoyable swing. The progressive waltz was perfect for the not so active amongst us and all the other dances were great to watch. People commented on the patience of the caller. The final dance had the floor filled to capacity with all who could muster the energy joining in with great enthusiasm. That extra 10 minutes was a lovely bonus, much appreciated by all. We would like to thank you all again for playing so brilliantly at our party on Saturday evening. Your caller had so much patience with us all and everyone had a wonderful evening. We will definitely be in touch if we do it again and would recommend you to our friends and family. Thank you so much for making last Saturday such an excellent evening. I have had so many compliments to pass on to you, we are very lucky and grateful that you come to our village celebration. Well done for fitting in all the music , it would be such a shame to not dance one of the dances we practise, and I realised we were getting short of time. Sadly our table of 11 only had 2 (my husband and I) who knew the dances and came to the practices , so we were not setting a very good example of getting it right, but I think on the whole most seemed to have a rough idea in the hall. It will take another week before I stop humming or whistling the tunes, your music was just perfect. Another brilliant evening with everyone enjoying themselves hugely. Thank you again for your part in making this happen. Even without Burns Night this year actually having occurred yet please can we book you for 2018? The date will be Saturday 27th 2018 � same time same place and I would be grateful if you would confirm with either Penny or myself. Thank you so, so much for playing for us yet again for us. What an amazing set of musicians you are. I can't wait to dance to your music again. We had such a brilliant time, as did all our guests. Hurrah! We want to say thank you for playing at our event on Saturday. We've had several comments about the band, all were very complimentary and some of my Morris Dancing friends thought you were fantastic. Vic certainly got the party going and we know that everyone had a good time. Some people didn't dance at first but once they had plucked up courage to do so they enjoyed it so much that they joined in again. So, thanks to you and the other musicians. Hope to see you in the near future. Thank you and the rest of the Band so much for making last night such a success. We managed to fit in so many dances and Vic your �To the Haggis� was brilliant. I have checked the calendar and January 21st is the requested day for our Burns Night in 2017. Hopefully you will be able to put this in your diary and send Hilary the appropriate booking form. A great night for a very worthy cause. We hope to hold it next year, and would be delighted if you could make it, as your band is always a huge success. I just wanted to say a BIG "thank you" to the band for making my 50th birthday celebrations so special at the weekend. I have had so many compliments about the band from family at friends, all of whom had a great time. My mother-in-law, Kathleen Mason surprised herself at the grand age of 83, with her ability to jig along with the youngsters. I have passed your details to several of my cousins, and I believe that the local swimming club are looking to contact you for their annual club summer gathering. Please pass my thanks to all the band. Your patience and good humour, as well as the cracking tunes, made for a very special day and memories that I shall cherish. Just to say how much we enjoyed last night. I have never known David dance so much and he says he particularly appreciated the good music and the range of reels, squares etc. Thank you and the rest of the band for being so brilliant on Saturday. The feedback is full of praise for the band and we feel so fortunate to have you come to our Burns Night in Graffham. Have a fabulous 2015 and we will see you with great excitement on the 23rd January 2016. 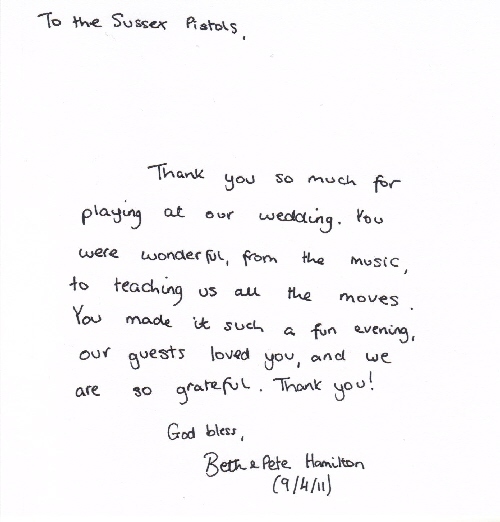 Just a quick note to say thank you so much for playing at our wedding yesterday. Everybody thought you were fantastic, and you made the evening! ....thanks again for a splendid Bash last night. I'll have to admit that when the idea of a barn dance for our reception came up, I was strongly opposed, but she was insistent and in the end she got her own way. I was totally wrong! The band were great and all our crowd seemed to have loved it. ,.......did remind me that i had forgotten to thank you and the rest of the band for another superb ceilidh on Burns night. Although we were a bit light on numbers this year, we made �900 for the church fabric fund and the enthusiasm and amount of dancing that went on more than made up for it. Feedback from everyone has been great. Thank also for supporting the raffle and bar. Many thanks again and I hope to see you again next year. 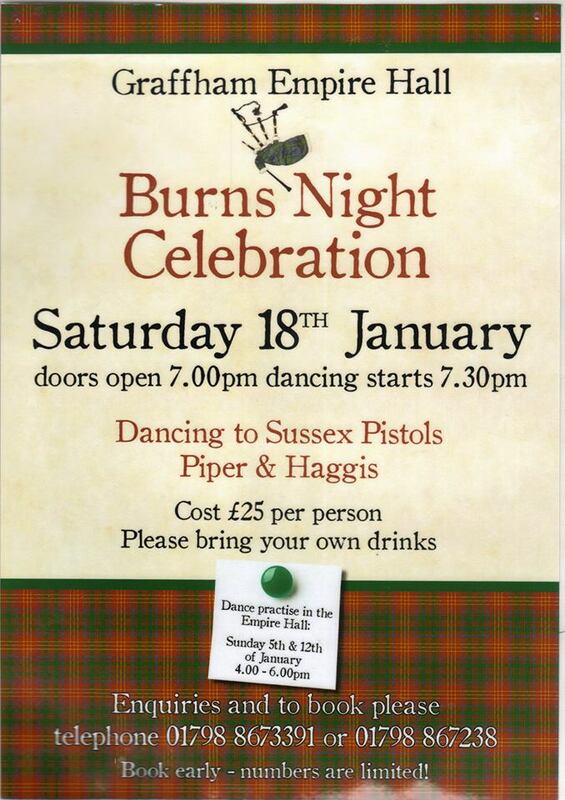 Many thanks to you, Tina, and the rest of the Sussex Pistols for a great night celebrating Burns Night Graffham style. Could have done without the behind the scenes problem of the cookers not working plus the poor people who wrote off their car in the floods, but I think we got away without most people noticing. We all had a fantastic evening and are planning next year already. Would love to try out Machine Without Horses as well, and I have no idea what the music for that is like! Just wanted to say a big THANK YOU to you all for another fantastic evening. Everyone had a brilliant time - some of Frankie's friends had never been to a ceilidh before - now total converts! Please pass on my thanks to everyone and best wishes to all for the rest of the Christmas hols and New Year! Just a quick thank you for playing at our party on Saturday night. We all had a fantastic time despite the awful weather, it may have been damp outside however our spirits were not dampened. We hope you enjoyed the evening as much as us. We would like to thank you all so much for such a wonderful performance at our Downhill Festival, last weekend. You were just brilliant, kept everyone dancing, and kept the music going all evening. With that said, would you be good enough to book us in again for next year, I have booked the large marquee already, just in case the weather lets us down. It will be on Saturday 12th July 2014, same place, same time, are you available? A very big thank you for the great music and entertainment for John's birthday bash on Saturday. Everyone had a great time. Barn dancing is just perfect for all ages. Just wanted to say a very big thank you to the band for a brilliant evening on Saturday 9th March at my 50th Birthday party in Horsham. Everyone said they had a ball, and I couldnt have asked for it to have gone any better. It was perfect and just how Id imagined it would be. We loved all the dances, and are now trying to persuade another friend who is 50 in a years time to do an encore! Thank you again for making my evening memorable. I just wanted to say a huge thank you to you and all the band for a superb evening on Saturday. Everyone had a wonderful time and the feedback has been incredible. People are already demanding a repeat! The dances were exactly the right level for the participants and the clear instructions were a great help. We have raised about �2000 for the church restoration fund which is a brilliant result. I've only just surfaced from all the celebrations around my birthday. Please pass on my warm regards to the band, who did such a brilliant job playing for my 70th birthday. So many people said the music was wonderful and the volume perfect. Everyone seemed to have a good time, so it's good to hear that you did, too. I don't think we'll wait for my 80th to have another Barn Dance! Someone suggested next year. And thanks also for the info on the ceilidh at the winter solstice. 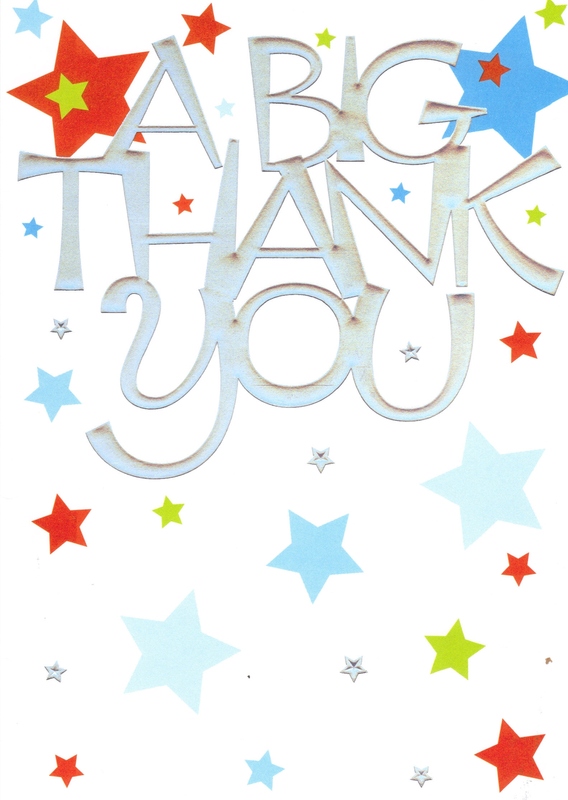 Just to say thank you very much for the barn dance on Saturday 21st. Everyone loved the music and the dances and the evening was a great success. Vic worked REALLY hard trying to keep order! Great gig - love to get you back sometime. Many Thanks to you all for a memorable and fun evening, enjoyed by everyone there! Including the rowdy rugby players I think! A huge thank you to you all. Everybody really enjoyed themselves at the barn dance. It is not many events that you have every single person dancing at the same time! It was also lovely to see that nobody minded who they danced with so it was a complete mix of friends, family and all ages. Everything was great, pitched at just at the right level for our party � most of whom had never been to a barn dance. The party had been a surprise to our Danish family and it was really nice when you started playing and they said �oh, its Irish music!� we were able to say that it was English music (although I�m sure there was one or two Irish tunes amongst them). Even the one whose face fell when we told him what we had planned said afterwards that we shouldn�t hear him say it but he did enjoy it very much! He was also dancing nearly the whole evening. Great fun and great music. I just wanted to write and thank you and the band for playing at our Barn Dance last Saturday, everyone had a great time dancing, your caller was really good at getting everyone involved. Lots of people mentioned to me that you were better than previous bands we've had and I will certainly keep you in mind for any future barn dances I organise. Thank you for making it a great evening, we raised over �300 for St Richards Eye Surgery Unit, thank you very much for your donation. I would like to thank you for giving Jane and Rob such a wonderful evening. It was a delight to see Ian after a gap of a couple of years or so and Vic�s idea to do the first dance with the children was a stunner. The music was fantastic, the calling excellent and we were delighted that you joined in so well with the celebration. So many of the guests commented at how well you got us all dancing. Jane and Rob asked me to give you all a special �thank you�. Please would you pass on our grateful thanks to all the band for a great evening on Saturday. Everyone enjoyed themselves. It was great to hear Bob Lewis sing during your break and was a nice touch to have one of our Volunteer Rangers entertaining us. 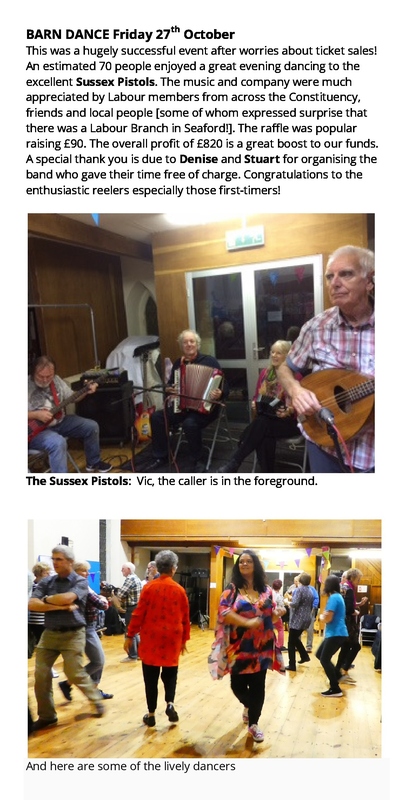 I just wanted to thank the band so much for coming to our barn dance on 25th June and playing so brilliantly. The band certainly helped to create such a happy fun atmosphere and so many guests commented on how good the band was, and what a great evening it had been! The caller was also excellent and it was great the way that he just �got on with it� and even initiated the singing of �happy birthday� � thank you so much! Sorry didn't see you go on Saturday night to personally thank you all for a great evening. We have had some lovely feed back and everyone seemed to have had a really fun evening. Hope you enjoyed it too and the journey home was uneventful. Better late than never! We wanted to thank you for the wonderful music at our 30th Wedding Anniversary Ceilidh on June 19th at Bidborough Village Hall. The great music-making and calling, and genial presence of your band really made the evening, as we hoped and trusted it would. 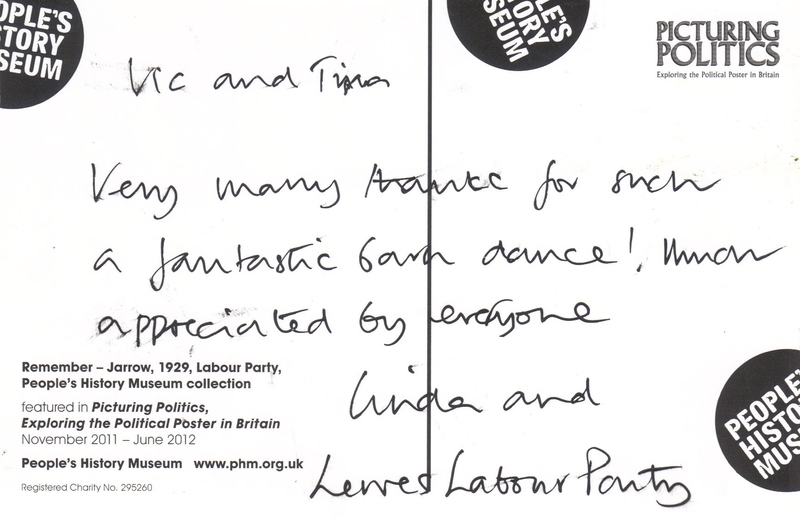 Many of the guests had never danced to folk music before and wrote to tell us what a fantastic time they had had, and how much they enjoyed themselves. It was a real pleasure to see so many people of all ages flying round the dance-floor with huge smiles on their faces, even our little 14 year old Spanish great-nephew, who is now no doubt persuaded that the British really know how to have a good time! Two of our guests were inspired to immediately start plans for a ceilidh for their own forthcoming special dates! Once again, our grateful thanks � it wouldn�t have been the same without you. thank you so much to yourself and all the band. Everyone had a fantastic time. It was great to see friends and family of all ages up on their feet . It certainly is an inclusive style of music. Many thanks for a fantastic night on Saturday. I have had so many compliments about the evening especially when so many people had never been to a barn dance before. Also many of those who had; thought the band was fantastic and mentioned that the caller was one of the best they had heard. We had a great evening, a party to remember. 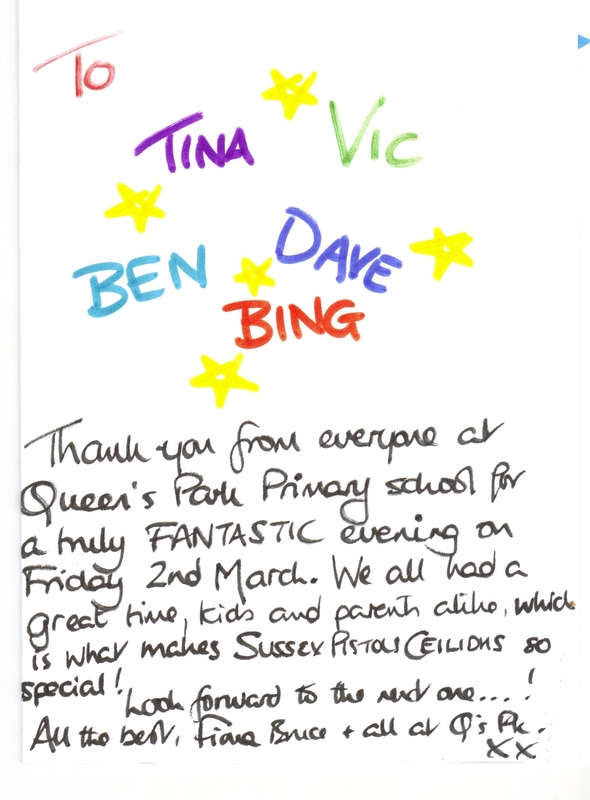 Thanks for a brilliant evening at Queen's Park School - come again! I just wanted to write and thank you so much for making my party the success it was - everyone thoroughly enjoyed themselves and loads of people mentioned how much they enjoyed having a live band and how good they thought you were. The music certainly made the evening go with a swing and I felt completely relaxed, knowing that you were in control of the music and entertainment! It was lovely that all ages including the children joined in - I don't think the little girls stopped dancing at all! The boys were not quite so forthcoming, apart from my youngest grandson Arthur, who thoroughly enjoyed your music and couldn't stop jigging around in time to it! I thought you were all so lovely, going with the flow of the party, and playing us a tune occasionally instead of just the dancing I thought was inspired, everyone enjoyed that and it gave those of us who had been dancing, a chance to watch you play. It all added up to one of the happiest evenings of my life and certainly one I will always remember with joy. My best wishes to you and all the band. A big thank you to yourselves and Ian, Dave, Ben and Bing for really fun and successful evening at Godalming Borough Hall. As it was a charity event there was a very large number of people new to barn dancing and yet you had them up on the floor and dancing right to the end - and enjoying themselves, which was the main thing! I can also confirm that the dance made �410 for WaterAid. Thank you so much for entertaining us last saturday. Everone enjoyed the dancing and it created a fun and lively atmosphere. We thought you managed the crowd very well, especially as it's probably rather unusual for you to come in half way through a party, but you got the mix that we hoped for, people could dance and others could chat. Thank you for helping our 60th go with a swing. Thank you so much for your outstanding performance at our wedding. Many guests who assured us that they would not be dancing did in fact get up and join in! We also received many compliments about the variety and range of the music. We hope that you enjoyed the evening as much as we certainly did. so much for playing at out wedding. You rocked the house (....or tent)! We hope that you had as much fun as we did. Thank you all so much for giving us a real day to remember on Sunday - it was fantastic! I did wonder at first how we would manage to get the French up on the floor, but they really loved it! I hope we can arrange another occasion before too long so we can see you again. I think we had all had a lot of fun and exercise. Thank you for helping to make the occasion such a happy one. Just a quick email to thank you for the great Ceilidh you did for our wedding reception at the Elephant and Castle last month. Everyone had a great time and enjoyed the music even if they didn't dance. Many people said how nice it was and miles better than a disco! Please pass on our thanks to the other band members. Just wanted to say again how much we enjoyed Saturday. You and the boys were superb and everyone was very complimentary about your performance.. Hamish was pleased it went well and I'm grateful to him for the recommendation. A great night that Ros really appreciated. Thank you so much. It was a great evening and most of the thanks must go to you all for making it so. People really enjoyed themselves and many have said how uplifting it was in these times of Credit Crunch & terrorists threats etc. Also they have a good laugh when they get it wrong which is fun in itself and great to watch by those sitting out. Thanks to you both and all the Band for helping to make our pre Infirmity Party so successful!! Over in Brighton, the best family party is the Winter Ceilidh at the Corn Exchange on December 20. 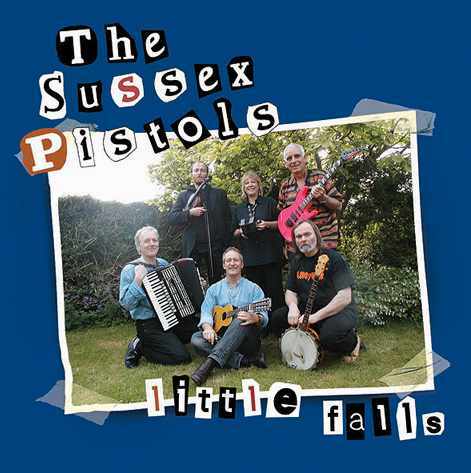 Local maestros the Sussex Pistols will have you reeling and jigging to frantic fiddle tunes from 7pm. Parents get a bar to cool down, while kids have their own staffed chillout room. Really. This event was also selected on page 31 of "The Guide" in "The Guardian" for December 20th as one of the three best events for Christmas week! First of all, so sorry that it has taken me so long to send this email! I just wanted to say a huge thank you to the Sussex Pistols, on behalf of Matt and myself, for the amazing set you played at our wedding!! Our guests are still commenting on how much they enjoyed it. It was so lovely to see all our friends and family, young and old, having such a fantastic time. The calling and playing were equally brilliant. I have been to a few barndances in my time and that was absolutely the best!! Thanks very much to you and the band for helping to make our party so memorable. Your sound is excellent and you actually seem to enjoy making music! I just wanted to say everyone really enjoyed the Sussex Pistols at Hove Rugby Club, and it was great for you to get everyone up and dancing! I will definately be using you for future events. August 2008 Can I say how pleased we were that we chose your band to play at our wedding. You were brilliant and to have got the French out of their seats was a real achievement! Everyone that has been in contact with my parents since the wedding have praised you really highly. August 2008 Thank you for playing for series of the weekly ceilidhs for the Open University Summer Schools. we would like you to know that in our surveys, we got nothing but positive feedback for your events. We hope that you will be able to play for us again next summer. July 2008 Just wanted to say a huge big 'thank you' for making our party go so well. I have had so many phone calls today saying thank you and how brill you were. You certainly made it a success. Just wanted to drop you a line and say a very big thank you for last night. Everyone thoroughly enjoyed themselves and were very complimentary about the band. It was great to look around and see so many laughing, smiling faces! Ellie especially had a great time and felt her birthday was brilliantly celebrated. January 2007 Hello Tina, May I take this opportunity to thank you and the band for making our Burns night such a success. Everyone really enjoyed your music. It was wonderful to see so many happy faces dancing the night away. We have had so many positive comments about the evening, so on behalf of Brighton College Family society- Well done! Just wanted to do a quick note to thank you so much for the barn dance last week. Those that came had a fantastic time and said it was so much fun! You were all brill. We loved the music. Thanks again. We'll be in contact again - no doubt." Thank you so much for playing at my 60th birthday party - you were wonderful! Did I pay you enough? - you worked so hard, it didn't seem much." 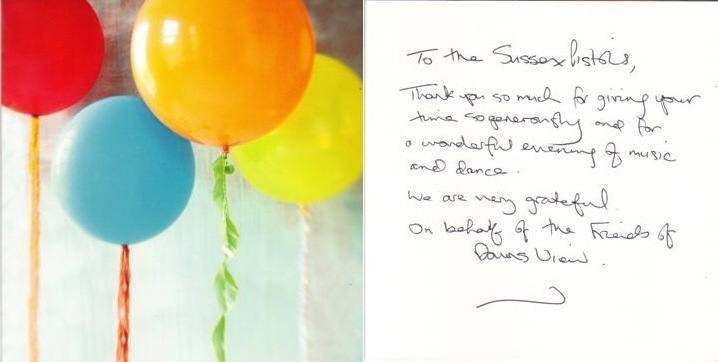 Thank you for the wonderful barn dance last weekend. Everyone has been telling us how much they enjoyed both the music and the dancing." May 2006 "Can you please thank the band for playing at our wedding reception. We had a wonderful time, as did all our guests. You really made the reception the party we wanted! Thank you." 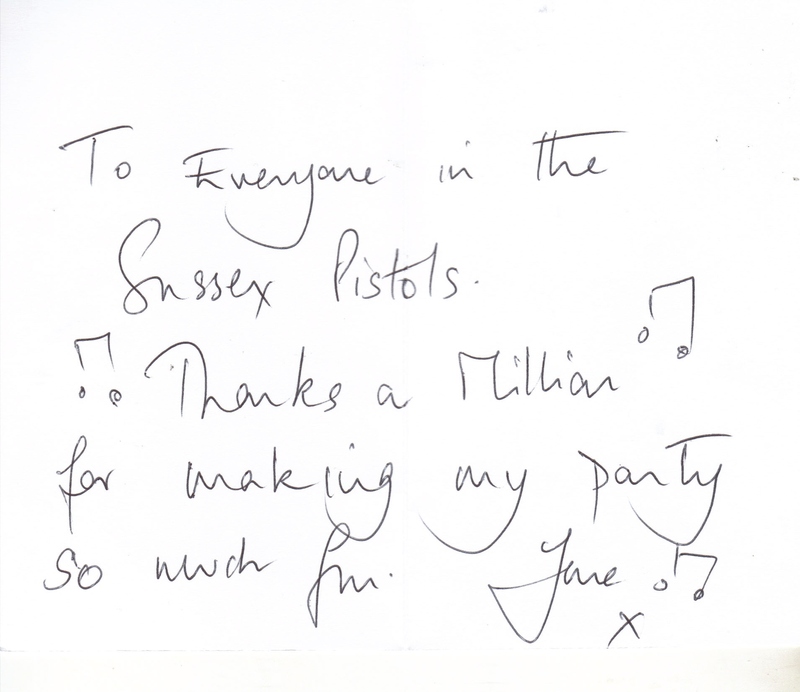 We would like to thank you and the rest of the Sussex Pistols for playing at our wedding last Saturday at Walton's Oak Barn. The music was great and played with huge enthusiasm and energy throughout. The caller was wonderful and made it very easy to follow even unfamiliar dances." September 2003 "Thank you so much for playing at our wedding. Everyone there said how great you were and we thought your playing was wonderful! If we ever have another big party I'd love to have you play again." July 2002 "Thank you so much for playing at our wedding. The video we have of the barn dance makes hilarious watching, and it really stands out that everyone is happy and had such a great time. Please pass our thanks on to the caller who did a great job coaxing reluctant guests." October 2001 "We have been reliving the happiness of a week ago! what a super evening. Thanks to your excellent group - wonderful musicians who entered into the spirit of the occasion and gave us such a brilliant time." February 1999 "We would like to thank The Sussex Pistols very much for playing at our wedding reception. We thoroughly enjoyed the music and the dancing, and so did our guests. Thank you once again"
July 1993 "This is to say a huge thank you to you and the rest of the band for all you efforts last Saturday. Everyone I have spoken to had a really great time. This was mostly due to the quality of your music and the wonderful calling. May 1993 "I would like to thank The Sussex Pistols for providing such a lively entertainment during the evening. We have received many compliments on the success of the evening and this was largely due to such an excellent band and caller." 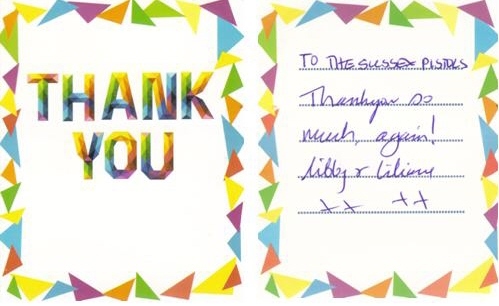 March, 1992 " It was the best evening we've had for ages and we've had lots of appreciative letters. The band was great and really exciting and uplifting. Many, many thanks." To book Vic & Tina for a song event, Email them. To book Bing & Ben for a song event, Email them.